Another radioactive water leak in the sea has been detected at the crippled Fukushima nuclear plant, the facility’s operator TEPCO announced. Contamination levels in the gutter reportedly spiked up 70 times over regular readings. The sensors are connected to the gutter that pours rain and ground water from the plant to a bay adjacent to the facility. The levels of contamination were between 50 and 70 times higher than Fukushima’s already elevated radioactive status, and were detected at about 10 am local time (1.00 am GMT), AFP reported. After the discovery, the gutter was blocked to prevent leaks to the Pacific Ocean. Throughout Sunday, contamination levels fell, but still measured 10 to 20 times more than prior to the leak. "We are currently monitoring the sensors at the gutter and seeing the trend," a company spokesman said. He did not specify the cause of the leak. 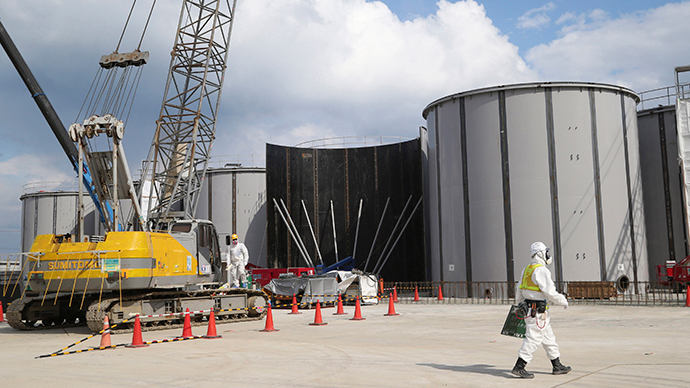 It has proved difficult for TEPCO to deal with plant decommissioning. Postponed deadlines and alarming incidents occur regularly at the facility. Earlier this week, the UN nuclear watchdog (IAEA) said Japan had made significant progress, but there is still a radioactive threat, and a “very complex” scenario at Fukushima. About a month ago, TEPCO announced it would miss their toxic water cleanup deadline, suspending it until the end of May, after earlier pledges it would be done by March.